We’re a nation opposed to taxation. It’s a part of our history. The Tea Party movement that’s railing against government took its name from the Boston Tea Party when colonists dumped tons of British tea into Boston Harbor to protest “taxation without representation.” The sentiment seems to be the same now. If elected officials aren’t conducting themselves as you would like them to, then supposedly they aren’t representing you (depending heavily on how one defines representation), and yet they continue to tax you. How dare they?! On the other hand, Americans seem okay with some taxes–sales tax and particularly the special local option sales tax (SPLOST) seem to be a well-accepted part of our culture. It’s income taxes that people really seem to dislike. Presidential pipe-dream Ron Paul is so opposed to government involvement in the lives of Americans that he wants to abolish the income tax and dismantle the IRS. Yeah, good luck with that. But the opportunity in this is to realize that people are much more comfortable being taxed on consumption than income. It may not make a huge difference, but in some key respects, people view consumption as optional and that changes how they feel about paying those taxes. Most countries already employ a VAT as indicated in the map below. 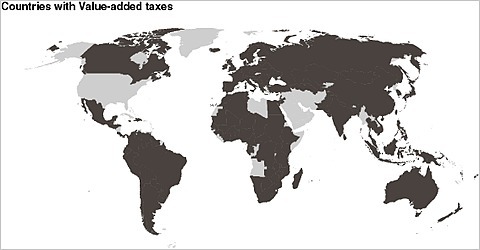 The darkly shaded countries had a VAT in 2008. There are pros and cons to the VAT, however. Perhaps the biggest pro is that as a consumption tax, the VAT does not discourage–in fact it may even encourage more–saving. The same is not true of income taxes. Historical trend data and recent economic woes clearly demonstrate that Americans have overspent and undersaved. Introducing a VAT–perhaps in place of all or some portion of the income tax–might seriously correct this imbalance. There are other pros, too, and a number of articles out there advocate the VAT. On the other hand, conservatives and liberals alike have found reasons to object to the VAT. As Rampell notes in her primer, conservatives oppose the efficiency of the VAT, which they foresee encouraging rampant government spending, while liberals oppose the VAT because of its potential to be regressive (disproportionately affecting the low-income). The liberals’ concern could be handled by excluding essential items like food from the VAT. If you want to read a conservative argument against the VAT, what better source to go to than the Wall Street Journal? Let me be clear on my stance: I don’t advocate introducing the VAT in addition to the state and federal income taxes and state and local sales taxes we already pay. Rather, I think that the VAT represents a better approach to taxation and should be considered only as an alternative to all or some portion of the current income tax we currently pay. I think doing so would make us better savers and more conscientious shoppers. Fiscal responsibility in this nation starts with its people, and the VAT could just do the trick. The latest Health Wonk Review is up at Jason Shafrin’s Healthcare Economist blog. He uses an NBA-playoff style format to pick the top 16 posts from the last two weeks. I was on the bubble–my post didn’t make the Sweet 16, but did get included as a “lottery” pick. As an additional plug, Jason’s blog is typically quite good if you’re at all interested in Health Economics. I read it regularly and you should, too. Do New Drugs Raise or Lower Health Care Costs? New prescription drugs seem to be coming to market all the time as evidenced by all those direct-to-consumer advertisements you see on TV telling you to ask your doctor about your inability to get an erection or the pain that prevents you from playing with your grandkids or the depression that follows you around in the form of a raincloud with a frowny face. And, as you know if you’ve ever filled a prescription for these new drugs, they’re expensive. That leads to an obvious question: If there are all these new drugs, and they are so expensive, won’t that lead to an increase in health care expenditures? The answer isn’t so clear cut. If all that happened was that we spent more on drugs, but our other use of the health care system didn’t change, then yes, these new expensive drugs would raise costs. On the other hand, if by using these drugs, our health improves to the point that the expense on drugs is more than offset by the savings from not needing to consume other types of health care, then we would expect a reduction in costs. Basically, Civan and Koksal found that the newer the drugs being prescribed were, but the lower per capita health care spending was in the state. As they put it “This implies that newer drugs not only increase the quality of medical care, but also actually lower the total health expenditures.” Other models the authors ran confirmed that the states with newer drugs spent more on prescription drugs but less on other types of health care. In other words, the newer drugs are more effective, make people healthier, and as a result they seek other types of health care less often than they otherwise might. One word of warning, however, is that these results are observed in the aggregate, and an individual’s result might well vary. In other words, don’t switch to a newer medication just in hopes of spending less on your own health care. You may have noticed that I’ve begun occasionally including links to products available for purchase through Amazon.com. You may also have noticed that I like to send you in the direction of good resources online. Well, now, I’m going to let the two intersect in what I am calling “Great Books in Health Policy.” I don’t want to claim that this will be a regular thing, because, well, we all know what happened to my “Lazy Sundays” pieces, but I do think that it is impossible for a blog about the health care system–especially one as complex as ours here in the U.S.–to be as thorough as it needs to be. So, for those of you who are inclined to learn more, I’ll be giving you links to great books. I’m starting today with two suggestions. One is a primer on the U.S. health care system and the other is an excellent look at the role of the presidency and politics in attempts to enact health reform in the U.S.
http://rcm.amazon.com/e/cm?t=wrighto-20&o=1&p=8&l=bpl&asins=076374512X&fc1=000000&IS2=1&lt1=_blank&m=amazon&lc1=0000FF&bc1=000000&bg1=FFFFFF&f=ifrDelivering Health Care in America: A Systems Approach by Leiyu Shi and Douglas Singh is a must-read if you’re trying to understand the current U.S. health care system. Granted, much is likely to change with the enactment of health reform, but this text covers the basic structure of health care finance, delivery, and consumption in both the public and private sectors. I’d give it a 3 on the Wonk Scale, because it is a textbook, but that shouldn’t discourage you from reading it. The Heart of Power: Health and Politics in the Oval Office is written by two of the best health politics and policy folks around: David Blumenthal and Jim Morone. If you’re looking to place President Obama’s leadership (or lack thereof) into proper historical context, this book is the place to start. Blumenthal and Morone trace the history of presidents and health reform beginning with Franklin D. Roosevelt and continuing all the way through George W. Bush. What makes this book especially http://rcm.amazon.com/e/cm?t=wrighto-20&o=1&p=8&l=bpl&asins=0520260309&fc1=000000&IS2=1&lt1=_blank&m=amazon&lc1=0000FF&bc1=000000&bg1=FFFFFF&f=ifrinteresting is that Blumenthal is a physician and Morone is a political scientist. Thus, two very different but complementary perspectives are presented in the book. I give The Heart of Power a 2 on the Wonk Scale, because while it is a pretty detailed exploration of the presidency and health reform, it’s superbly written and that makes it easily digestible for both scholars and laypersons. In fairness, before you read this post any further, why don’t you go ahead and confirm Limbaugh’s remarks for yourself by reading or listening to the segment. Okay. Now that you’ve done that, can we agree that I’ve accurately captured Limbaugh’s remarks? Good. Time to debunk them. For starters, ObamaCare is nearly identical to RomneyCare (the Massachusetts reforms) in many respects, and Heritage took credit for the RomneyCare ideas. So, to the extent that RomneyCare and ObamaCare are similar, Heritage has every right to take credit for the ideas in ObamaCare. The fact that they don’t want to is another story. Guess what? The health insurance exchanges that Congress just passed into law? Yeah, they’re implemented at the state level. So, once again, Heritage has every right to take credit for the ideas in ObamaCare. They just don’t want to. That doesn’t seem to me to be the workings of a “nonpartisan” think-tank. It’s fine to be a conservative think-tank. Just don’t try to have it both ways, because when you do, you lose your objectivity and your credibility won’t be far behind. For the best overview of this whole Heritage Foundation flip-flop, you need to read Timothy Noah’s piece at Slate. A few weeks ago, I wrote a short post exploring the results of a simple analysis I conducted to see if the House votes on health care could be predicted. What I found, essentially, was that political divisions–not constituents’ needs or lobbyists’ money–made the difference. In a two-part series (here and here), Maggie Mahar of the HealthBeat blog reaches similar conclusions without using all the fancy econometric methods I employed. She does one more thing, too, which is to compare and contrast the Obama health reform effort with the Clinton health reform effort. Of course, Clinton’s effort failed, whereas Obama’s succeeded, but the differences don’t stop there. Of course, my model only looked at final support of the bill–and in so doing overlooked important changes in its content. For example, the public option was stripped from the legislation. Did lobbyists’ dollars do that or was it just Joe Lieberman’s ego? And for every apparent lobbying win (PhARMA) there are apparent lobbying losses (hospital industry). So, if anything, lobbying played a part in tweaking the final shape of the bill, but it didn’t affect its ultimate passage. Highly partisan politics are to blame for that. In America, our work ethic is next to none. We work longer hours each day, more days per week, and more weeks per year than just about anywhere else on Earth, with the possible exception of Japan. When the French are sunning themselves for three weeks on the beaches of Malta, we are seated at our cubicles humming along to the buzz of the soul-sucking fluorescent lighting. Why do we do this? If you answered “To get ahead” you’d be wrong. Despite all our long hours, and our two-income households, we’re not any better off. In fact, one look at consumer debt averages across the country would suggest that we seem to be slipping. We don’t save and we spend what we have and then some. And we run ourselves ragged in the process. It also causes us to cut corners. All that time we spend sitting at our computers working on whatever it is we work on is time that we don’t spend with our families, relaxing, unwinding, fostering relationships, or even exercising. In fact, we rarely sit down at the table for a meal anymore, because we don’t have time. Despite all the time saving technology that exists to make our lives easier, we find that there are still too few hours in the day, so we swing through the drive-thru at McDonald’s on our way to or from the office. As a result of all this, our bank accounts are no better off, while our relationships suffer, our emotional and mental health languishes, and our physical health deteriorates. As Marc Ambinder explores in detail in a recent article for The Atlantic, we are a fat, fat people. Burning the candle at both ends is only good for one group: Candle makers. In this analogy, the candle makers are the insurance companies.Why? Because, according to a recent study out of Harvard, health insurers take the money they make off of you and I and invest it in–of all things–fast food corporations. Do you need more proof that they don’t want us to be healthy? If we stay well, they win–because they keep our premiums and don’t have to pay out claims. If we get sick, they win–because they get a cut of all that money we’ve been spending on Big Macs. It’s a win-win business model for them and a lose-lose deal for us.